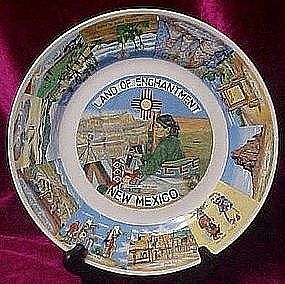 A wonderful 10 1/8" diameter souvenir plate of New Mexico, The lland of Enchantment. This plate features as a center decoration an american Indian weaver, and the border features 11 points of interest and famous things the state is recognized for. Kachina dolls, Eagle dancers,carlsbad caverns, the continental divide, Indian pueblo's and more. Perfect condition with no damages. Made of ceramic.